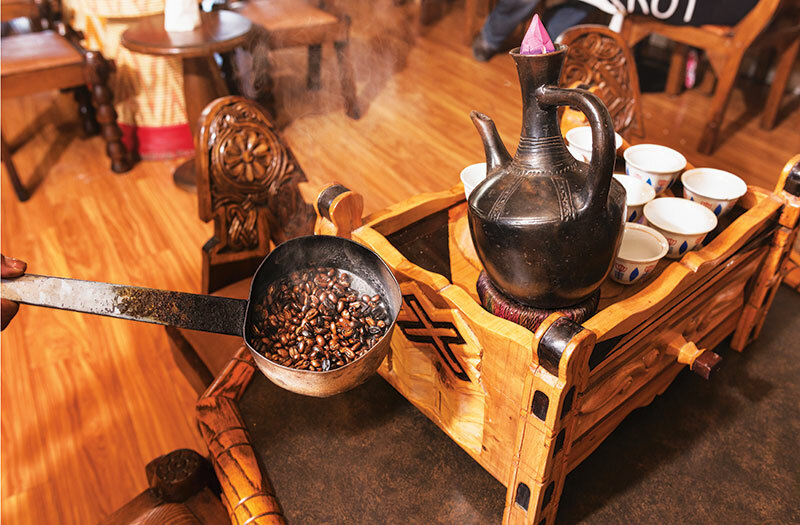 The East African restaurants along Fairfax take their traditional coffee ceremony seriously—with nary a barista or latte in sight. Here’s how it unfolds at Messob. ing from the freshly browned beans. Once the beans have cooled, they’re coarsely ground with an electric grinder. In Ethiopia they’re usually ground in a heavy wood bowl, called a mukecha, with a blunt wood or metal cylinder, known as a zenezena. The coffee is brewed inside a clay pot, or jebena, which is designed to allow the grounds to settle at the bottom of the container while the coffee steeps. The narrow spout acts as a sieve to keep most of the grounds out of the cup. A tray laden with handle-less cups is brought to the table, along with a small vessel for burning incense. The coffee is poured from the jebena in a steady stream until each cup is filled to the brim, and it’s served black. The small batch preparation yields a smooth, strong beverage with no hints of acidity or over roasting. Sip it slowly while snacking on a combination of peanuts and cooked barley.